Yes, I am a kitchenware junkie. The kitchenware section of a store is my favorite area. I can spend an hour perusing the small housewares section of T.J. Maxx and there's only about three rows. I look at every single item to see if I need to add it to my kitchen collection. 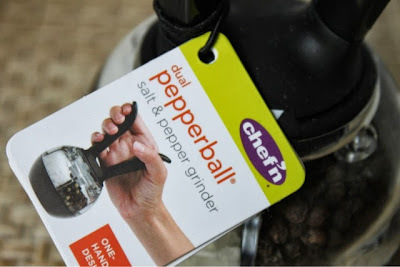 Chef'n must know about my obsession because they sent me several items to test and review. How do you like this whisk? I love it! 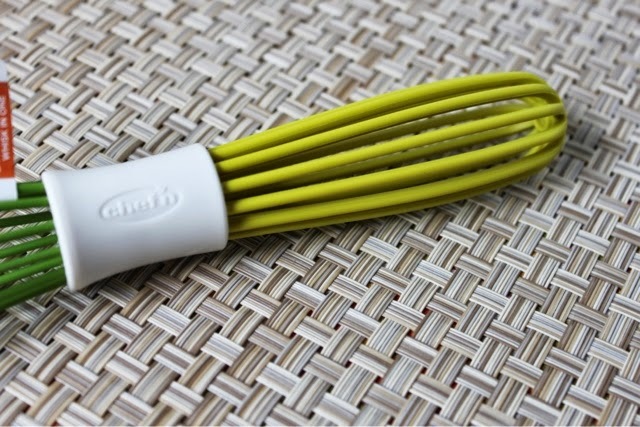 It's two whisks in one, perfect for when you're extra busy in the kitchen and don't have a second whisk within reach. Plus, it's in my favorite color...green. There are several colors to choose from. 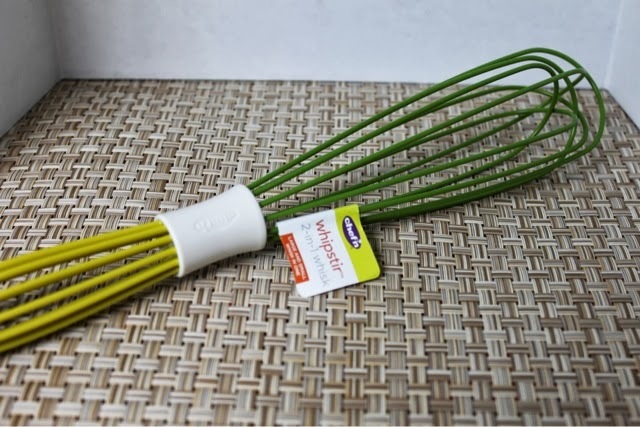 I think this whisk would work well if you had to pack a few kitchen items to take camping or if you were going to cook in another kitchen away from home, anywhere where your space is limited. Besides whisks, I'm also a little obsessed with measuring cups. I cried out in joy when I pulled these from the box. Yes, they're green and they're beautiful. 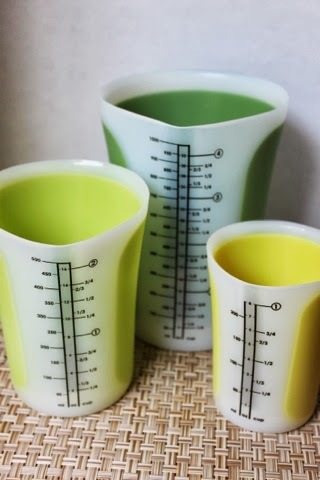 These measuring beakers come in a set of three with 1, 2, and 4 cup capacities. 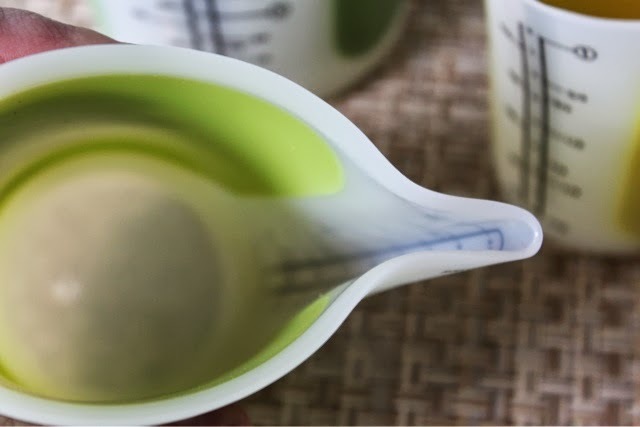 Whenever I'm having a marathon baking session, I always use several measuring cups so these beakers are perfect for those days when I don't have time to wash the dishes as I'm baking along. 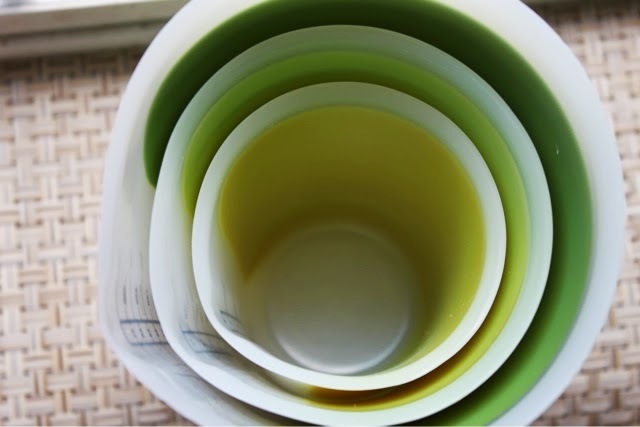 The beakers fit inside of each other so, unlike traditional measuring cups, they save space in your cabinet. They are made of silicone so are very flexible. Because they are flexible, they bend easily to create a pour spout. Wouldn't this feature have saved me from some major spills? Finally, I received this Dual Pepperball - salt on one side, pepper on the other. I haven't owned a pepper grinder in quite a while and had been considering buying both a salt and pepper grinder. I have tons of whole peppercorns that needed to be used. My 10-year-old is a pepper freak! He puts it on everything so his eyes really lit up when he saw this. He couldn't wait to get grinding. 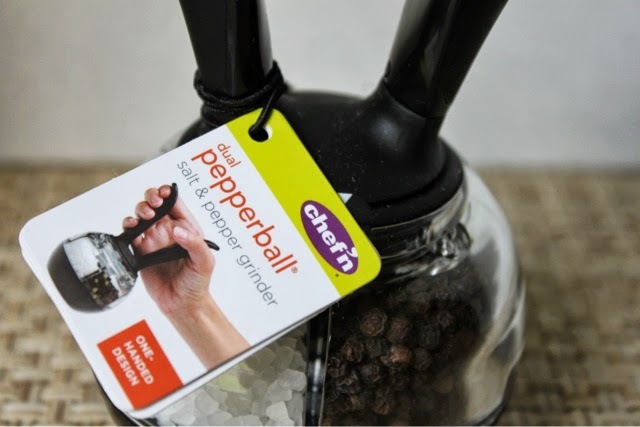 The grinder is simple to use: turn the arrow to one side for salt and turn it around for pepper. The handle is easy to use and is a one-handed design. Whenever I'm plundering through the kitchenware section of the store, I do look for certain brands, brands I know produce quality products. I've added another brand to my search list...Chef'n. I recommend that you add them to your list, too. Every product that I tested from them was high quality. 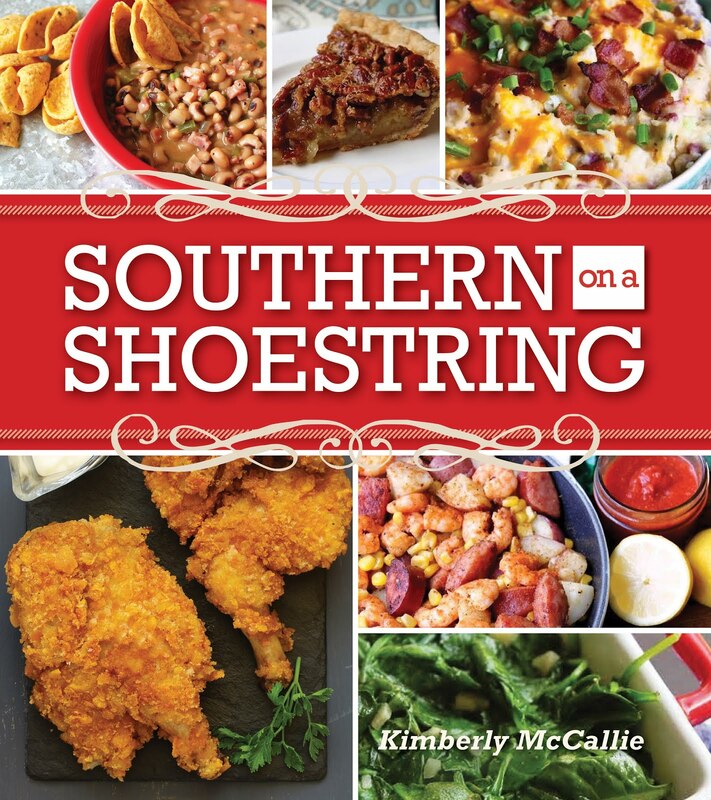 As you can see from their web site, they have a large selection of products that can make your kitchen not only more functional but more fun. Disclaimer: Chef'n provided me with these products for review; however, the opinion expressed here is my own. So many fun toys! One can never have too many kitchen gadgets! Pampered Chef just came out with a set of flexible silicone bowls. I didn't think I needed them but I use them daily! I would comment more on your blog if I didn't have to prove I was human. Old tired eyes have a hard time deciphering the letters and numbers. Thanks for commenting, Cindy. I know that the "human" thing is frustrating. I hate doing it on other blogs, too. I have to restrict it as much as possible because I go through phases with nonstop spam and highly inappropriate comments.